Manly Guys Doing Manly Things » MOVIE OF THE YEAR Y/Y? You are like a valkyrie of failed serious things, picking up their fallen forms and delivering them to the Valha-ha. Yeah, I know, wrong mythology. So what? It’s okay, the Kraken is from the wrong mythology too, and that didn’t stop anybody. All I know is that the Medusa looked hot… she turned something of mine to stone, Heh he he. …wait, does that make me a furry? I’m surprised that there isn’t a single God of War crossover. 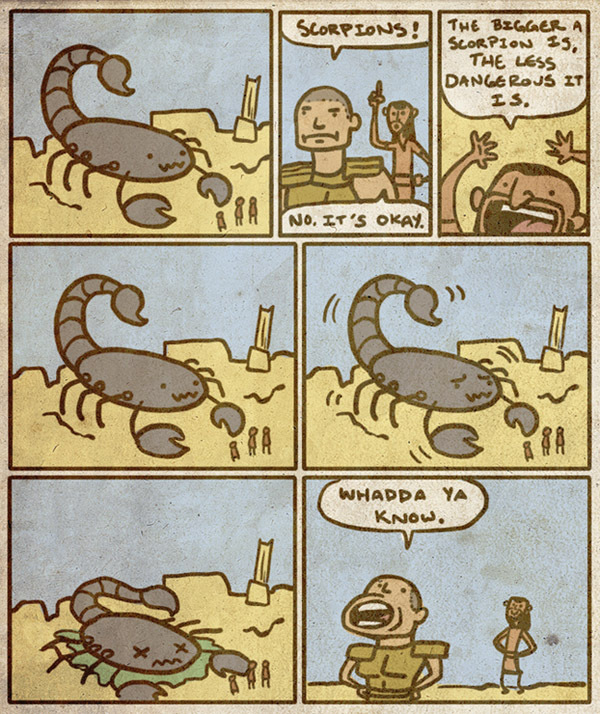 Was there really a scorpion so big that it collapsed on itself naturally? The whole movie is essentially God Of War crossover, because EVERYTHING in Clash Of The Titans is in God Of War!!!! The Kraken, Medusa, giant scorpions, Pegasus, Zeus, Hades, Perseus, etc.